The largest arena of Azerbaijan will be ready by the end of February 2015, according to project officials. Earthwork is 90% done as well as foundation piling, while the stands are growing constantly. 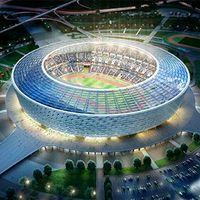 Tural Ramazanov, Chief Engineer of Regional Social Projects Provision Department of SOCAR, said that the operations connected to Baku's new Olympic Stadium are ongoing in accordance with the plan. Roughly 2,200 people are on site as well as 300 pieces of machinery, including 9 large tower cranes. "The earthwork within the framework of the construction began in November last year. At present, the works are completed by 90 percent and the earthworks have been carried out in the volume of 6.5 million cubic meters. Currently reinforced concrete work is under way at the stadium," Ramazanov said. According to him, the stadium will consist of four areas, including the two upper zones with six-storey stands, and the two bottom ones with three-storey stands. Concrete works are continuing. "There are some 1,720 bored piles under the foundation, and the construction of the foundation has been completed. In total, some 350,000 cubic meters of concrete are supposed to be used, 235,000 cubic meters of which have already been used. Some 52,500 tons of reinforcement will be used in the construction, and 41,000 tons have already been used," Ramazanov said. Regarding car parking, Ramazanov said that according to Olympic standards, people mostly have to come to the stadium on foot or arrive by public transport, therefore, a car park with 3,500-4,000 parking spaces is being built. He noted that the Olympic Stadium will seat 68,700 spectators. Moreover, Olympic Village occupying space of 382,397 square meters will be available at the inaugural European Games in Baku's Nizami district close to the main facilities intended for holding the Games - the Olympic Stadium, Water Sports Center, the gymnastics complex and the airport.